This Is A Chevy Covered In Bees! Mix bees and a yellow Chevrolet and most people think of Bumblebee, the friendly 2006 Camaro-derived Transformer. 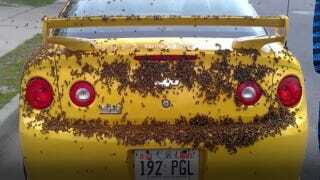 But a swarm of bees turned a Utah family's Chevy Cobalt into a real life Bumblebee of sorts. A beekeeper in Tooele, Utah said that a queen bee attached itself to the car, causing the rest of her grist to follow and turning the yellow Chevy into an impromptu hive. Matt Key's son found the car crawling with bees when he arrived home from school on Monday. His dad responded with incredulity when first approached with the idea that his car had become the locus of a swarm, but he eventually took a look, calling city officials to help him take care of the problem. A beekeeper, somehow or other aligned with the city, showed up and moved the bees by putting the queen bee in a portable hive next to the car. Once the queen was moved, the other bees followed, and the Cobalt transformed back into a normal, boring Chevrolet.